Same simple design, user-friendly features, and proven quality…now in a smoother-running, stronger, lighter version. 300XGe has 10 bearings plus advanced Carbon Matrix drag for exceptionalsmoothness all through the fight. FREE spare spool. "The reel needs work on the bail due to malfunction. About every other cast was bail problems. It was fustrating because the line would get loose or it would get tangled up with fish eyes. Mitchell still makes a descent reel but this model needs work." 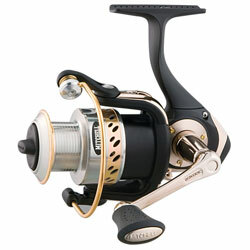 "I bought the Mitchell 300XGe spinning reel and love it. I pared it with a medium light(ML) Ugly Stik and have had great success with it. Its smooth, light weight and durable. Definitely worth the buy." "I bought two 300XGe's last summer and found them to be excellent spinning reels." "I purchased this reel about 6 monthes ago. I fish every week with reel and it seems no matter what I do or what line I use, this reel always has my line in a tangle."